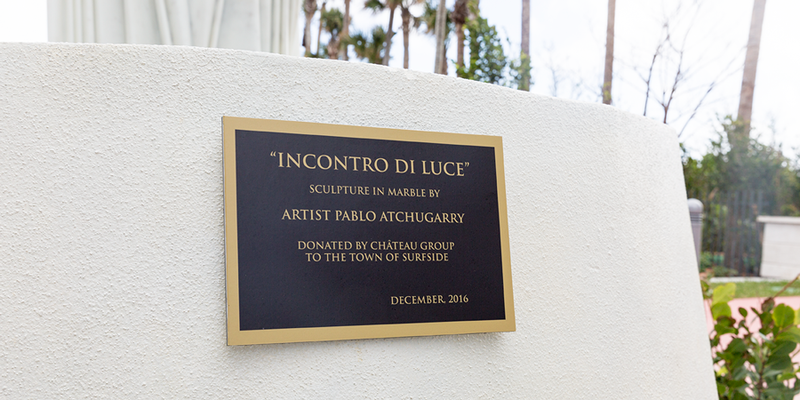 In the latest news about Surfside happenings, we are happy to share that the Fendi Chateau has donated a marble sculpture by artist Pablo Atchugarry to the town. With the completion of the 94th Street Beach End beautification project, the original piece is on display for the public to enjoy. Pablo Atchugarry is a world-renowned South American artist hailing from Uruguay and best known for his abstract sculptural pieces. He works primarily with stone, carving both figural and abstract forms reminiscent of plants, trees and waves, alongside the human figure. His works are included in many major private and public collections and have been included in exhibitions on display at the Venice Biennale, the Chrysler Museum of Art, Museu Brasileiro da Escultura in São Paulo, and the Pérez Art Museum here in Miami, among many, many more. This year, Surfside welcomes the FENDI Chateau – the first boutique luxury condominium by renowned Italian brand FENDI. The FENDI Chateau features 58 spacious residences with stunning views of a pristine mile of oceanfront beach complimented with thoughtful amenities designed by FENDI Casa. Designed by Miami-based Arquitectonica, the residences are a beautiful architectural addition to Collins Avenue.